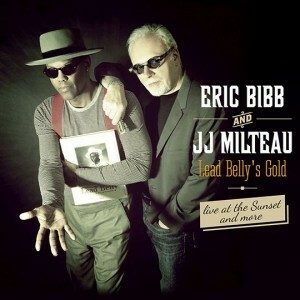 A Paris jazz club, The Sunset, had a special treat as Eric Bibb and legendary French harmonica player JJ Milteau recorded a live album covering the music of Lead Belly. Both musicians are no stranger to success as they titled the album, Lead Belly’s Gold. Considered “the king of the 12-string guitar,” Lead Belly had a successful career despite serving time in prison. An early American folk/blues singer, he wrote songs about Adolf Hitler, Jean Harlow, and Howard Hughes. Lead Belly influenced many from The Beatles to Nirvana. Considered to be the first rock ‘n’ roll singer, Lead Belly’s music career started in 1903 and lasted until his death in 1949. In 1988, Lead Belly was inducted in the Rock and Roll Hall of Fame. Eric Bibb and JJ Milteau were the perfect match to cover such a great artist. Eric opens with “Grey Goose.” Lead Belly would approve of this spiritual delta sound as the electric harmonica from JJ gives it a French effect. “Where Did You Sleep Last Night,” is awesome. Eric gives a superb intro to the piece that stays close to Lead Belly’s version. Then JJ Milteau kicks into a harmonica solo that is marvelous. But it’s Lead Belly’s “Goodnight Irene” where the album soars. The Weavers were probably the first to cover the piece. The Weavers said publicly that “Goodnight Irene” is Lead Belly’s signature/theme song. It’s a classic three-quarter time number covered by Eric Clapton, Leon Russell, and Keith Richards. It’s extraordinary how one song can connect with so many musicians. But it’s Eric and JJ that bring the past to the present with “Goodnight Irene.” It’s a solid and standout piece for the album. I’m sure there are many who never heard of Lead Belly. But he did for folk and the blues what Jimmie Rodgers of the 1920’s did for country music. Eric Bibb and JJ Milteau have put together an album that is unique. When they recorded this album, Eric and JJ accomplished two things. First, they were able to pay homage to one of the greatest artists in American history. Second, they were able to cover great songs, but also call attention to their own musical approach. I’m JR Miller with High Note Reviews, and this is Eric Bibb and JJ Milteau playing Lead Belly’s Gold.